A little while ago I told you about the return of the Masterton Museum collection to Aratoi, thereby honouring a 58 year-old agreement. In that collection there were some really interesting items so I thought I would tell you about another one of them. 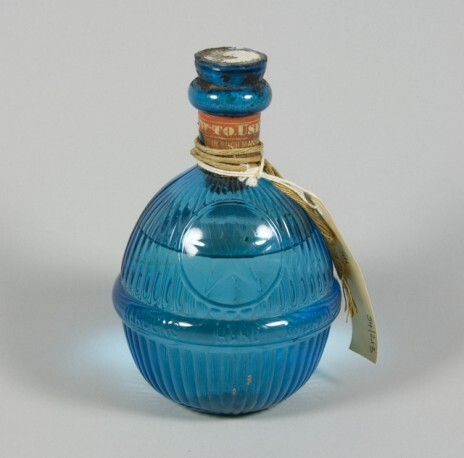 It is a very pretty blue glass orb with a neck, looking something like a vase. It is filled with liquid, incorporates brown string knotted around the neck to create a carry handle, and is firmly stoppered with a cork and a cement plug. Does this arouse your interest? Are you curious? Around the circumference of the bottle, moulded into the glass are the words “Hardens Hand Grenade Fire Extinguisher”. This should give you a hint! Yes… this is an early type of fire extinguisher made of thin, fragile glass so it shattered easily when thrown at the seat of a fire. These kinds of extinguishers were made in the USA from the 1860s to around 1910. Early versions were filled with harmless salt water but some were filled with the more toxic carbon tetrachloride. We weren’t sure about the Masterton Museum grenade extinguisher so, just to be on the safe side, we packed it up super-securely and pasted warning signs all over the packaging. I can report the grenade made it safely over the hill. We are about to take a second and much smaller consignment over to Masterton at the end of the week. I expect it will be as rewarding as the first trip.